“When I grew up, I wanted to work with animals but, at the time, I thought the only two options were to be a veterinarian or an animal trainer,” explains Seana Dowling-Guyer. With an interest in understanding behavior, however, Dowling-Guyer pursued a Master of Science in Clinical Psychology at the University of Alaska. She then returned to Massachusetts, where she would work in corporate market research for the next 14 years. At the same time, Dowling-Guyer was also hoping to expand her family. “I’ve loved animals my whole life. I had cats, I had a horse, guinea pigs, ferrets, but I wanted a dog—my husband was not too keen on the idea, though,” she says. With an unwavering drive to assist disadvantaged animals, Dowling-Guyer became Executive Director of the Center for Shelter Dogs. 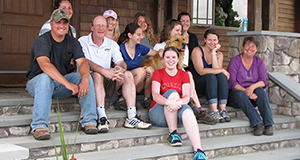 When the grant that funded the center at ARL ended, Cummings School brought the program to its campus and she stayed on board as associate director. 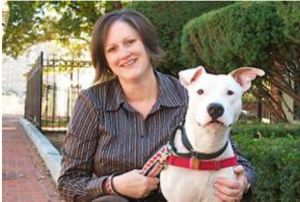 Throughout her career, she has focused on research that seeks to better understand animal behavior, including one project that found dogs that showed food aggression in the shelter would not necessarily show it in a home. “It made the whole field step back and reevaluate the way they were using and thinking about food aggression evaluations in the shelter,” Dowling-Guyer explains.